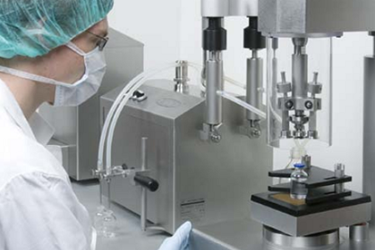 Manual Aseptic Processing: The Last Resort Or The Best Approach? There are many pharmaceutical manufacturing applications where small batch sizes are common: specialty pharmaceuticals, high-value medicines, gene therapy, cell therapy, compounding, allergenic extracts, etc. There is also an increasing need for efficient aseptic filling capacity and techniques as the biotech industry and its innovative therapies expand in scope from cell therapies and CRISPR technologies. The increase in the number of Phase 1 and Phase 2 trials where only 50 to 100 patients are being treated greatly exacerbates the situation. In the past, standard vendor equipment offerings included automated filling lines with outputs of 50 or more containers per minute. However, complications arose when the total batch size (1,000, 100, or even 10 total pieces) was too small to justify an automated filling line. As processing demands have changed, many vendors now provide equipment for processing small batch sizes. Automated filling lines excel at producing large volumes of quality product in an efficient manner. The tradeoff for this efficiency and high output is inflexibility and high capital cost. Operational routines on an automated filling line consist of long changeover times due to their large size, complicated mechanisms, and numerous change parts. This is followed by time-consuming line clearance and cleaning as well as RABS sanitization or isolator turnaround to prepare for the next batch. A common rule of thumb for designing a filling line is an 80 percent utilization target. This takes into account product filling (PF) and filling line changeover, which includes post-fill environmental monitoring (EM), line clearance (LC), machine breakdown (MB), line wipe down (LWD), change format parts (CFP), final line wipe down (FLWD), and isolator turnaround (ITA). In a small batch size or low output scenario, long changeover times relative to the product filling duration will result in poor machine utilization and filling economics, as the machine must undergo a full changeover between each small batch. Most companies with drugs in Phase 1 and Phase 2 clinical trials use contract manufacturing organizations (CMOs) and incur disproportionately high fees for their services. Manual aseptic processing (MAP) is a solution for these scenarios. Although the operator takes a central role with this approach, cGMPs must still be followed. Since the most likely source of product contamination in a production suite is from the operator, it is critical to separate the operator from the operation to the greatest extent possible. How is this done if the operator is the central component of any manual aseptic process? 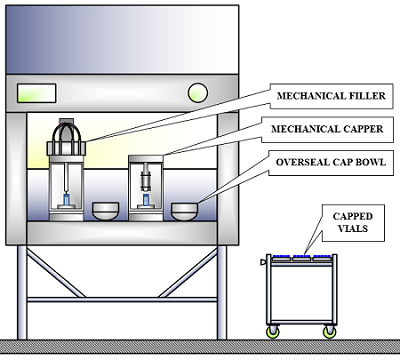 There are several equipment options that allow for improved aseptic technique (Figures 1 and 2, below). Place ready to use (RTU) container (cartridge, syringe, vial, etc.) on filler load cell. Dispense precise amount of product into the container using filling machine. Apply stopper to the container using autoclaved forceps. Move fully stoppered container from manual filling machine to manual closing machine. Apply overseal cap, plunger, etc. to the container using autoclaved forceps. Seal container using the container closing machine. Using a ready-to-fill closed vial is a similar process: the stopper is pierced with a non-coring needle, a precise amount of product is dispensed into the container, and the stopper is resealed with a laser beam. Since MAP equipment uses few format parts, if any, it is very easy to change between container sizes and types. This equipment can accommodate vials of any size, as well as cartridges, IV bags, syringes, or even novel developmental containers. Manual aseptic processing also supports the use of presterilized components, which further reduces capital costs and facility footprint, as expensive component washers and depyrogenation ovens are not required. 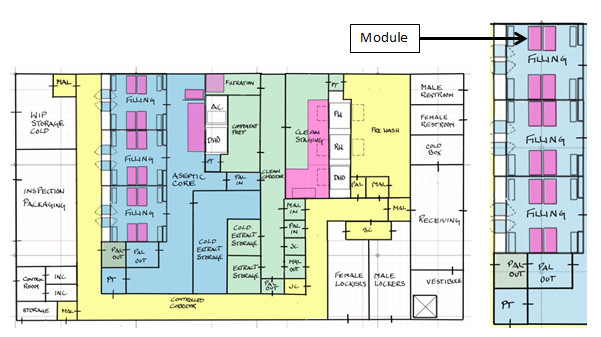 MAP may be executed within laminar flow hoods (LFHs), biosafety cabinets (BSCs), or isolators, based on the application, characteristics of the product, required level of protection, and project cost constraints. A summary of the application for these containment enclosures is in Table 1. The minimum recommendation is to use a laminar flow hood to perform manual aseptic processing operations. A downward airflow velocity of 0.36 to 0.45 m/s is required to meet EU guidelines, and the system must be built to prevent pressure fluctuations within the GMP filling room from affecting the processing space of the LFH. LFHs are primarily used for the protection of the product, which means their use is limited to products with no risk to the operator. The flow path of the air supply from either a horizontal (air flows from back to front,) or a vertical (air flows from top to bottom, preferred path) LFH exposes the operator and the environment to the product. The airflow from an LFH prohibits its use when product segregation is required. “BSCs are designed to provide personnel, environmental, and product protection when appropriate practices and procedures are followed.”1 As the classification of the BSC increases, the level of containment and protection for the operator, product, and environment increases. Based on the classification, BSC containment can range from a pull-down sash (Class I) to a gas-tight enclosure (Class III). An additional difference between LFHs and BSCs is the airflow path. BSCs draw air in from the room through a HEPA filter and into the processing space of the cabinet. No air exits the cabinet in the direction of the operator. Exhaust air is HEPA filtered and is either recirculated into the room or ducted out of the building (for potent, toxic or solvent based materials). To further enhance sterility assurance of the manual aseptic filling operation, closed bio-safety cabinets (BSC Class III) or modular VHP isolators are more advanced equipment options to consider. These options ensure operator segregation, as the process will be performed inside a sealed chamber that is accessed through glove ports. Modular VHP isolators such as the SKANFOG® PURE go one step further and provide a validated decontamination cycle for the operating chamber between batches. Implementation of continuous particle monitoring inside the LFH, BSC, or isolator will provide a warning if the environment has been compromised and the product is at risk of contamination due to an unforeseen deterioration of the air quality. Isolators may be prohibitive for most processing due to the rigidity of the enclosure and movement limitations. However, isolators minimize the overall risk for processing the product and maximize protection for the operator. The design of the isolator allows for placement in lower area classifications (Grade C or Grade D), whereas LFHs and Class I & II BSCs require a Grade B room background. There are several facility implications associated with such equipment. Filling and container closure equipment within an LFH or BSC creates a versatile “module” (Figure 3, above). The module allows for several LFHs or BSCs to be located in a single filling suite (Figure 4, below). Recommended overall operations methodology and techniques for manual aseptic processing are addressed in PDA Technical Report 62: Recommended Practices for Manual Aseptic Processes. An important operating technique is to ensure that “a primary operator performs the critical aseptic manipulations within the Grade A environment, and a secondary operator assists in the introduction/removal of items from the Grade A environment to ensure the hands of the primary operator remain in the Grade A environment at all times.”2 This arrangement prevents an operator’s gloved/gowned hands from leaving and reentering the Grade A space repeatedly, which would increase the risk of contamination. A Class III BSC or isolator does not involve such processing concerns because they are gas-tight and manipulations are made through glove ports. Once the container is capped or closed, the operating and environmental requirements can be relaxed. This allows for less stringent procedures when preparing the container for inspection, labeling, packaging, and shipping. Automated inspection machines are prohibitive for much the same reason as automated filling machines: high capital cost and low utilization. There are two potential inspection options: manual and semi-automated (Figure 5, below). The selection of one over the other ultimately comes down to the required throughput. When weighing the operational and product constraints, i.e. batch size, container throughput, cost per unit, equipment utilization, facility footprint, and cost per square foot, it is important to consider all of the options available to provide the most effective processing approach for the product manufacturer and, importantly, the best quality product for patients. Many may consider manual aseptic processing as a last resort, but in several circumstances, it can be the best approach. Biosafety in Microbiological and Biomedical Laboratories; Centers for Disease Control and Prevention: December 2009. Brendan Fay is a process engineer with Integrated Project Services, LLC. He has seven years of experience in pharmaceutical, biotechnology, and medical device manufacturing, engineering, and compliance. He has a B.S. in chemical engineering from the University of Notre Dame.